- Available Sizes: 45, 50, 55, 60, 65, 70, 75 Cms. We are the leading supplier in manufacturer of kids bloomer in tiruppur, and we are offering at an reasonable price. 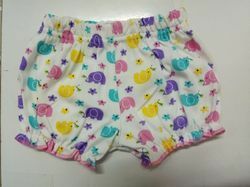 Matching up with the requirements of our clients, we are involved in offering Kids Cotton Bloomer. 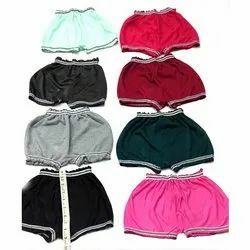 We have a wide collections of Bloomers available in various shapes sizes and colors. Our bloomers of premium quality are appreciated for shrink resistance, color fastness and perfect fittings. These bloomers are available in wide assorted colors, designs, styles and patterns in sync with the latest in fashion and trend. Quality being the ultimate concern, we offer a comprehensive array of Printed Bloomers that are neatly stitched and are tear-resistant. We offer them in standard sizes and are offered with colorful prints. Our entire product range is easy to clean and is comfortable to carry. Furthermore, we offer them in standard sizes. Available in cartoon printed sizes from 50 to 70 sizes, required bulk qty. Make your child step towards a relaxed style of fashion by wearing this exclusive Kids Bloomer. While fulfilling as many demands as possible, we are presenting Kids Bloomers in the market.